Here are some more new details for our Wisconsin overnight drive to New Glaris.Check out this post and this post for earlier information..
WRAPUP: 19 MINIs met up at the Beloit rest stop on a cold and drizzly morning. The weather alternated from sunny to cloudy to rainy, but the roads were 100% fantastic the whole time. Lots of twists and turns, ups and downs and very little traffic. We pulled into Monroe and filled up the top level of the parking garage, and then proceeded to enjoy the Chili festival and other area attractions. After lunch and picking up a few more MINIs, we headed off to more twisty back roads. A fun attraction on this portion was a herd of cows galloping around the field, excited to see a herd of MINIs zipping past. Our end of the day stop was a tour of New Glarus Brewery. The following morning we said goodbye to a few people spending the day in the area, and welcomed a few new MINIs along for the drive. After a fun and twisty drive to Mount Horeb, we enjoyed another town festival for a while, and off for the final leg to Monroe and a stop at a cheese factory. Huge thanks to Paul and Barbara for the tremendous amount of planning and organizing that he put in to make this such a fantastic event!! It was great to have so may people involved from all the area MINI (and Mini) clubs. Thanks for coming out for a really fun weekend!! Please e-mail links of photos to steve@chicagominiclub.com and I will add them here. The Minis in Northern Illinois club (M.I.N.I.) 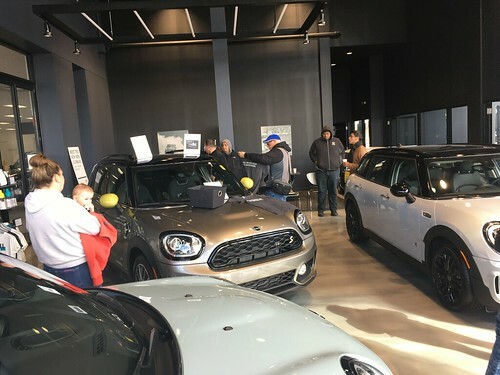 has invited the Chicago MINI Motoring Club to participate in their 3rd annual apple picking drive on Saturday October 10th. Chicago Indoor Racing is hosting a Car Club Challenge on Sunday September 27th. This is a 300 lap endurance race with teams made of of 3-8 people.